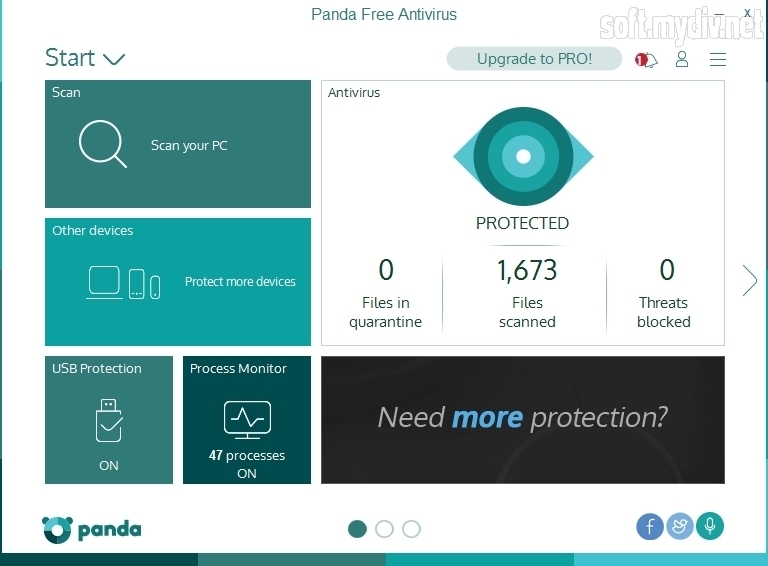 Panda Free Antivirus is a reliable solution for those who appreciate a high level of system security. This software offers the web and Wi-Fi protection. After installing Panda will check that everything is working properly and your system is secure. This may take a few minutes. Then the antivirus will be activated. The interface is almost similar to commercial Panda products. There are four tabs: Antivirus, Scan, Other device, USB Protection and Process Monitor. The scanner provides 3 types: full, critical areas and custom scan. If you haven’t checked your system before, we recommend you to select full scan. 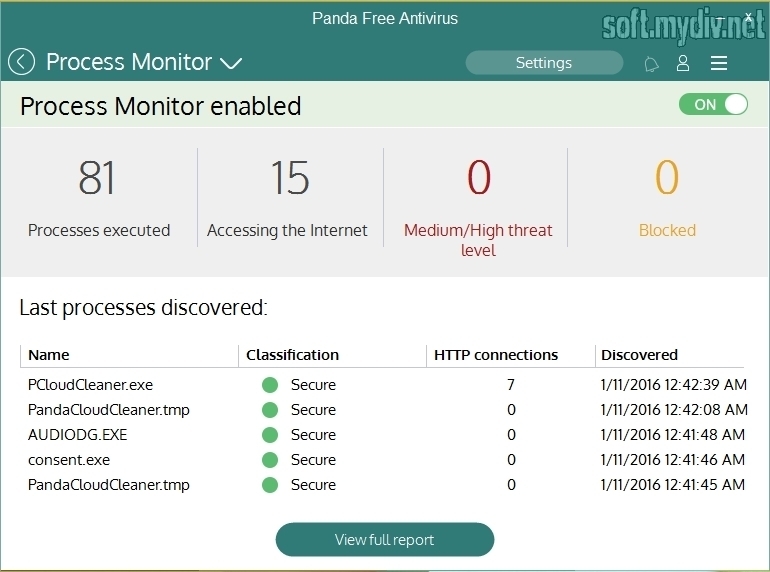 The antivirus screen displays the number of blocked threats and scanned files. USB Protection offers vaccinating option. If you have infected USB device, then Autorun execution will be removed. You can also use Panda Cloud Cleaner or rescue kit. The last one allows you to create rescue USB drive. Cloud Cleaner provides advanced scanning. Process Monitor displays security level of launched processes. You can customize your workspace by deleting unwanted tabs and adding new ones. If you want to do it, use Customization option. Social media buttons are on the bottom-right corner of the screen. The standard license also provides forum support. But it requires registration. If you need to set up backup, parent control, firewall or other additional functions, you should upgrade the antivirus to pro version. Panda shows the high score at malware detecting. However, it’s not so good against phishing threats. So, even if your antivirus is on, the browser protection should be active. You don't need to update the antivirus because it is always connecting to main server. Collective Intelligence system reduces time of threat detection and cleaning. Some functions are able only in commercial (Pro) version. 240 MB of free space.